Get your chum ready, Shark Week is Here! Shark Week originated 28 years ago as a week-long event that focused on shark based programming on the Discovery Channel. Now, however, Shark Week has evolved into so much more! Here at Moody Gardens we are busy planning special events and talks that focus on some of the most enthralling creatures of the ocean. Every day during Shark U Week, you can enjoy shark arts and crafts, Shark Talks with our shark experts, shark and ocean-themed movies and more. You can even participate in our Scavenger Hunt for a chance to win a Moody Gardens Family Getaway with 4 tickets to all of our attractions, a behind-the-scenes tour of the Caribbean Exhibit Wet Deck and an overnight stay Moody Gardens Hotel! Daily from June 26 through July 2 there will be an 11:00 a.m. sting ray feeding at the South Pacific Exhibit, a shark feeding at the Caribbean Exhibit at 1:30 p.m., and at 2:00 p.m. there will be a Keeper Shark Talk in the Ocean View Room. If you cannot make it to property for one of our in-person chats there will be virtual Shark Talks on Monday, Wednesday, and Friday live via the Moody Gardens Facebook page. Through the Facebook Live event, you can hang out with our shark experts as they chat about a variety of shark topics or you can have your questions answered in person at Aquarium Pyramid. Use #MGSharkTalk to join via Twitter & Facebook. Continue the interactive learning sessions with our See-Food Activity where you can look at the silhouettes of people compared to a shark’s food chain. Most shark attacks are a case of mistaken identity. During their attack, the victim is mistaken for prey. 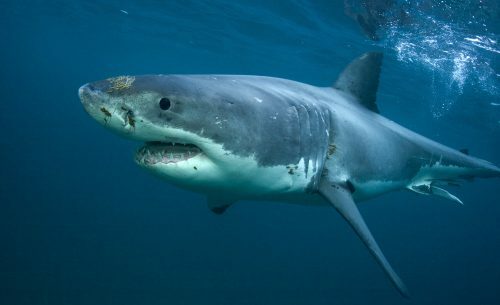 From a shark’s point of view, a surfer or swimmer can look quite similar to a turtle or seal. Stop by our Aquarium Pyramid to find out how easy it is for a shark to mistake a human for its prey. Throughout the week be on the lookout for the MG Shark Spots around the Moody Gardens property. Take a picture at each location that is marked by a fin and upload your pictures to Twitter, Facebook or Instagram using the hashtag #MGSharkQuest to be entered for a chance to win a Moody Gardens Family Getaway with 4 tickets to all of our attractions, a behind-the-scenes tour of the Caribbean Exhibit Wet Deck and an overnight stay Moody Gardens Hotel! You can buy tickets to start your own Shark Week adventures here! Next Next post: Happy Christmas in July!